Israeli authorities release two Palestinian women from detention on the condition that they do not enter the Al-Aqsa Mosque compound for the next two weeks. Locals told Ma’an that the two Palestinian women released by Israeli authorities were identified as Nafissa Khweis, 66, and Aida Sidawi from occupied East Jerusalem. Sources added that the Israeli authorities summoned Khweis to Jerusalem’s Old City Israeli occupation police station yesterday to recover her identity card as it had previously been confiscated after she left Al-Aqsa. Upon Khweis’ arrival to obtain her identity card, Israeli forces detained and immediately took her in for interrogation about her presence and worship at the mosque. Following the interrogation, Khweis was released on condition that she does not enter the Muslim holy site for the next fortnight. Israeli occupation authorities also released two Palestinian teens from detention on Saturday; they were identified as Rida Najib and Awni Najib from the Old City of Jerusalem. They have also been banned from entering Al-Aqsa for the next two weeks. Israeli occupation forces on Saturday detained two Italian artists for painting mural of Palestinian teen Ahed Tamimi on the separation barrier that snakes through the occupied West Bank. Muhammad al-Lahham, a Palestinian activist, told Anadolu Agency that two Italian activists and a Palestinian man were detained in Bethlehem when the artists were about to finish their painting. The 17-year-old Palestinian girl has spent eight months in Israeli jails. The whereabouts and identities of the trio remain unknown. On Friday, the two artists, who preferred not to give their names and who have not made any statements to the press, started to paint a larger-than-life portrait of the detained teen to express their support for Tamimi. Earlier this year, al-Tamimi was slapped with eight months behind bars for “attacking” an Israeli soldier. But the teen’s father, Basem al-Tamimi, on Monday voiced hope that his daughter — who was slated for release on Aug. 19 at latest — could be released Sunday. The Israeli occupation, however, have yet to announce an official release date for the detained teen. 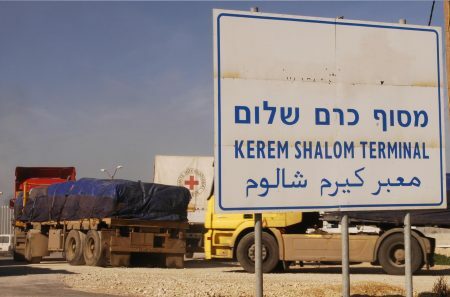 Israeli occupation authorities have banned, for the 19th day in a row, the entry of basic goods and humanitarian aid, via Kerem Shalom crossing, the sole commercial crossing with Gaza, MP Jamal al-Khudari, head of the People’s Committee to Face the Siege, stated on Sunday. Khudari said that the most recent truck was loaded with thousands of daily-needed basic goods, in addition to raw materials for industry, building materials, clothing, textiles, wood, household items, stationery and other essentials. Al-Khudari said, in a press statement, that this prohibition is causing the Palestinian economy, which is already deteriorating due to the blockade, and Israeli policies, direct and indirect losses of millions of dollars. He pointed out, according to Al Ray Palestinian Media Agency, that these trucks, carrying the basic goods for the survival , cost more than $60 million, are subject to multiple risks because of the occupation. Al-Khudari reiterated that the impact of this ban will lead to a rapid collapse of the industrial and commercial sector, and the collapse of all services, as a result. He pointed out that the current figures of poverty and unemployment are the highest in the world, and no one can know where it leads, under the Israeli blockade against 2 million Palestinians in Gaza, which amounts to collective punishment and flagrant violation of international law. He explained that the goods are officially bought and imported, and have all the approvals to pass through ports and commercial crossings, but the occupation hinders and returns them after their arrival to the crossing, causing heavy losses to owners, as the goods are stored for long periods of time, and are subject to serious damage due to lack of timely arrival. He called on the international community to exert pressure on Israeli occupation authorities to stop its collective punishment measures against the people of Gaza, which is considered a violation under international law. Israel yesterday intercepted a Norwegian ship sailing with the Freedom Flotilla en route to the besieged Gaza Strip. The ship, called Al-Awda or Return, was attempting to break the naval blockade of Gaza, which has been imposed on the enclave by Israel and Egypt since 2007. The Israeli navy intercepted the ship some 60 nautical miles from the coast in international waters, after issuing warnings that the ship was in violation of the blockade. The vessel is now being towed to Ashdod, an Israeli port town north of the Gaza Strip. On board Al-Awda were over 20 international activistsand politicians, two of whom are believed to be Israeli citizens. The ship was also carrying humanitarian aid and €13,000 ($15,000) worth of medical supplies destined for Gaza’s some two million inhabitants. A spokesperson for the Ship to Gaza Norway, Torstein Dahle, said that “the Freedom Flotilla Coalition calls on the Norwegian Government […] and relevant international organisations to act immediately,” the Jerusalem Post reported. The international community must assume its responsibilities and demand that Israeli authorities ensure the safety of those on board, the speedy delivery of our gifts to the Palestinian people in Gaza, and an end to the illegal blockade of Gaza. In a statement Israel said the ship was being detained according to international law and that “the activity ended without exceptional events.” It added that those on board the ship were told “any humanitarian equipment can be transferred to Gaza through Ashdod Port,” Ynet reported. Al-Awda was one of several ships participating in the Freedom Flotilla, which set sail in May in an attempt to break the blockade of Gaza. The flotilla has since stopped in the UK and Spain, and left the Italian port of Palermo, Sicily, last week for the final leg of its journey. The other ship, Freedom, has yet to be intercepted. It is completely impossible to calculate when and where we will be intercepted, as it has been at different distances from Gaza every time the flotilla has sailed. We have a plan on when to start getting ready for any possible diversion, but our goal is to reach Gaza until the opposite is forced upon us. Hansson also explains that, over and above intercepting the flotilla, Israel has systematically criticised and worked against their efforts. She says “one of their strategies in the event of interception is to prevent the media from covering what is happening. 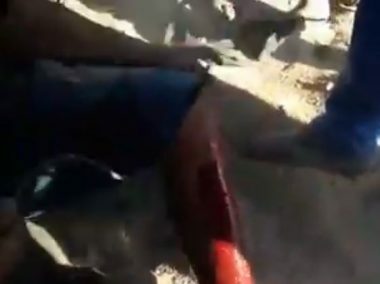 They also try to convince the world that we are terrorists,” likely referring to claims made by some Israeli media outlets that the flotilla activists are affiliated with Hamas, which currently governs the Gaza Strip. We know that the world will be watching this story and discussing Palestine and that the chance to highlight the plight of Palestinians is a privilege. On board Freedom, outside Palermo, Sicily. Another day of this nearly three-month sail is coming to an end, and I write from the mess of the Swedish sailing boat Freedom. I feel like turning the saying around and claiming that we are in a state of “storm before the calm”, as things on board are lying around all over the place! A group of participants, ground crew and local activists sit in the cockpit discussing logistical issues that need to be solved. Others are waiting for this evening’s dinner on the dock, and some are dealing with other preparations. It’s the fourth day since the four boats of the flotilla joined outside the Port of Palermo in Sicily, Italy, and we could actually wave to each other for the first time on the journey. It was a great feeling of unity and happiness seeing the boats together, with Palestinian flags, banners, and paintings hoisted high on the boats as the songs of Fairuz, a Lebanese singer wildly popular with Palestinians, blare from the speaker. We have spent two days undertaking intense nonviolence training, in which we went through different ways of preparing ourselves for prospective scenarios. Learning from the previous flotillas, there have been many interceptions by Israeli occupation forces and there’s always an unpredictable aspect. The training really emphasised the importance of safety and unity among the participants, and for me this was the moment I actually felt the seriousness of what we are about to do. Our schedule in Palermo has been packed with events and practical preparations, as well as doing what we can to spread the campaign through the media. This has become increasingly difficult since there are many conflicting issues going on in the world, so we need to do what we can to keep the flotilla in the news – the media noise is a thick wall to break through. Yet somewhere in all of this lays our cause. Images of bombings in Gaza flood our Facebook feeds and the Gaza Strip is highly present in all that we do. We know the people of Gaza are waiting for us, they feel our support and gain hope, even if it’s only a little. After long consideration, our departure for the last and most critical part of our journey is set for tomorrow morning, Sunday 22 July 2018. We’re part of something big, of solidarity with our human race, of the good in the world, of peace, love and justice for all. 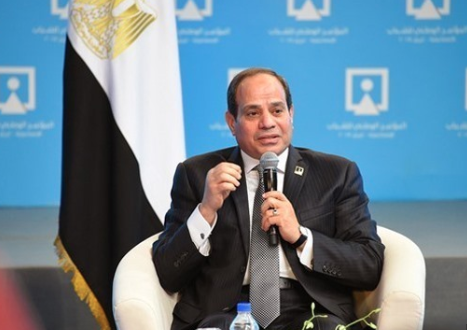 “We in the Gaza Strip and the Palestinian Authority are striving for reconciliation so that there will be one leadership to negotiate with Israel,” al-Sisi said during a session of the National Youth Conference held at Cairo University. Sisi called on Israeli public opinion, asking Israel to seize on the historic opportunity for the peace that is now available to them. For months, al-Sisi’s administration has been formulating a peace plan to resolve the Israeli-Palestinian conflict after US President Donald Trump’s unilateral recognition of Jerusalem as the capital of Israel at the end of 2017, angering and protesting the Palestinians. “Egypt is trying to be a positive factor and is quietly playing its role to reach a solution for the Palestinian-Israeli conflict,” al-Sisi said.